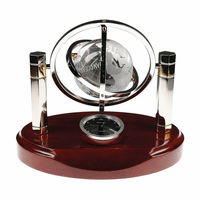 FEATURES/SPECS Upgrade the elegance factor on your desktop while keeping it organized with this crystal globe desktop organizer. 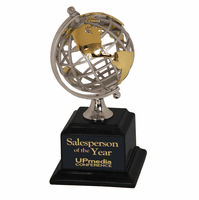 It has a solid wood, cherry finish base with a slew of features to keep clutter off your desk. 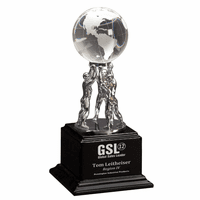 The centerpiece is the crystal globe set in a double rotating steel gyro (gyro allows it to rotate at all angles.) 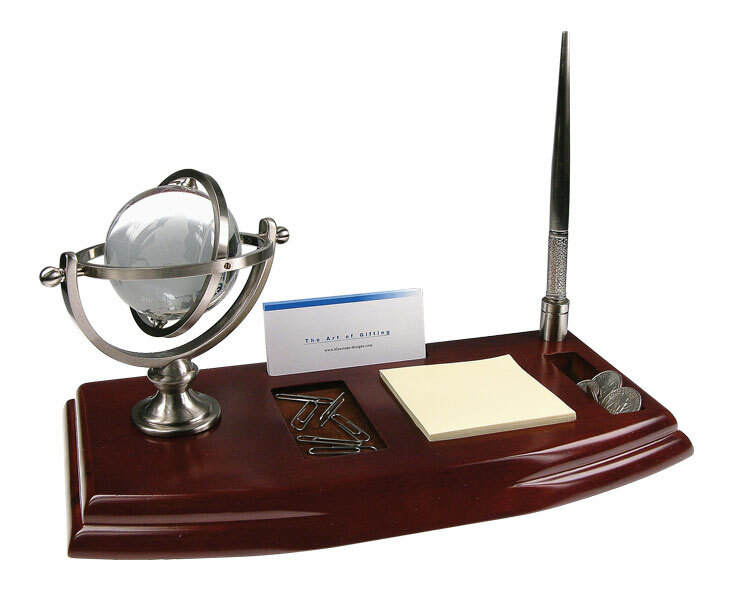 It has a slot to hold your business cards, a 3" by 3" notepad holder, slots of paper clips and coins and a pen stand with an included ball point pen. The bottom of the wood base is lined with felt to keep your desktop scratch-free. 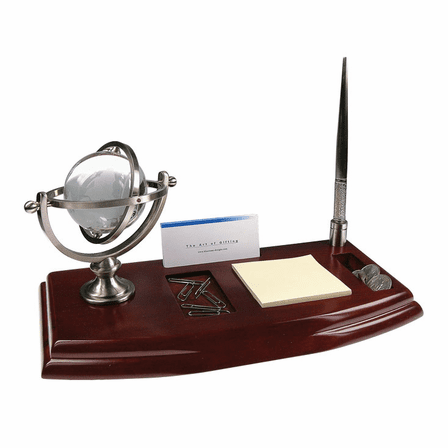 We'll be happy to add an engraved plate to the front free of charge, turning this globe desktop organizer and pen stand into a cherished personalized gift for someone special. 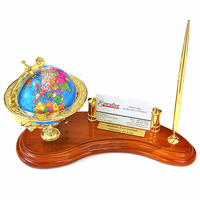 Dimensions: 10" x 4" x 5"
This looks beautiful, the globe is stunning. However, the engraving is almost impossible to read. You can read it if you already know what it says, even then you need to squint and try hard to make out the letters. Granted, I did use the curvy font, but that shouldn't matter - they should not offer fonts where the engraved letters bleed into each other so you can't tell what it says. Merchant Response:I'm so sorry you're unhappy with the engraving. We'd be happy to engraved new plate for you, in a different font. We'll reach out to you via email to arrange this. This order was shipped out the next day after it was ordered. It was of superior quality - better than expected. I will order from them again!